Lymphangiectasia is also known as protein-losing gastroenteropathy. It is a rare disease in which there occurs dilatation of lymph vessels of intestines resulting in excessive loss of lymph fluid into the gastrointestinal tract. It leads to hypoproteinemia, lymphocytopenia, edema, and immunologic anomalies. All these things lead to malabsorption. Idiopathic Lymphangiectasia is also known as Waldmann’s disease. Lymphangiectasia secondary to lymphatic obstruction or due to increased lymphatic pressure. WHAT CAN BE THE CAUSES OF LYMPHANGIECTASIA? The exact cause of this disease is not known in case of idiopathic Lymphangiectasia. In the second type of Lymphangiectasia, the cause can be improperly formed lymph vessels or blockage of lymph flow from the intestine. It can also be the result of obstructed lymphatics which leads to abnormal lymph drainage. Right-sided heart failure or pericarditis. Inflammation of lymphatics as in case of inflammatory bowel disease. WHAT CAN BE THE SIGNS AND SYMPTOMS OF LYMPHANGIECTASIA? Swelling of both or one leg, face and external genitalia due to retention of fluid. Low blood protein level leads to fluid retention. Low weight or inability to gain weight. Low blood cholesterol and blood protein. Ascites, fluid collection in the abdomen. Swelling of the whole body, i.e. anasarca. Presence of fat in the stool. HOW CAN BE LYMPHANGIECTASIA DIAGNOSE? Endoscopy, i.e. looking intestine with a scope that is flexible. Biopsy, i.e. examining samples of tissues from several affected areas of the intestines. HOW CAN BE LYMPHANGIECTASIA TREATED? In the conventional system of medicine, this disorder is mainly treated by dietary manipulation and sometimes may need surgical resection of small intestine's affected area. Treatment is continued for whole life despite of it remissions occur. WHAT IS AYURVEDIC INTERPRETATION OF LYMPHANGIECTASIA? In Ayurveda lymphatic system is called rasa dhatu which means "river of life". It is named so our lymphatic system is like a river with the long network in which lymph travels. This lymph consists of white cells which are responsible for the immunity so to maintain our immunity we need this river of lymph flow properly. Lymph and lymph vessels can be affected by aggravation of any of the doshas, i.e. Vata, Pitta, and Kapha Dosha. Ayurvedic treatment of Lymphangiectasis includes balancing of these doshas which will ultimately result in the healthy lymphatic channel. Treatment is done by pure and natural herbs. These capsules relieve flatulence and gas. Constipation is also relieved by it. Digestion support capsules stimulate secretion of digestive juices. It alleviates abdominal distension and pain due to acidity. It relieves dyspepsia and indigestion. Sanjivani Vati balances Vata and pitta dosha. Chronic fever is treated very effectively with it. It strengthens the immune system and increases body’s power to fight against diseases. As its name implies it improves overall health. It relives all signs and symptoms related to Lymphangiectasia. DOSAGE- Take two tablets two times a day after meals. These capsules are a herbal combination of Shallaki (Boswellia serrata) and Curcumin (Curcuma longa). Anti-inflammatory action of these capsules relieves inflammation in any part of the body and reduces pain and swelling. Boswellia-curcumin capsules prevent the breakdown of the connective tissues. It treats pain, swelling and other associated symptoms related to Lymphangiectasia. These capsules have antibacterial, antiviral, antifungal and anti-cancer properties. These capsules are single herb capsule made from the pure and standardized extract of Punarnava (Boerhavia diffusa). These are well known for treating water retention or edema anywhere in the body which is one of the main symptoms of Lymphangiectasis. Swelling and inflammation are reduced by its proper consumption as prescribed by a physician. It maintains healthy kidney function and promotes urinary tract health. Water retention is relieved by its diuretic action on kidneys. It is made from herb named as Gotu kola (Centella asiatica). It treats nervous exhaustion and low concentration. These capsules prevent acidity and gas due to anxiety and stress. The herb from which these capsules are made, i.e. Gotu kola (Centella asiatica) is rich in vitamin A, B, E, and K.
Neuropathy and cardiac diseases can be treated with the help of Gotu kola capsules. These capsules are known to improve memory. 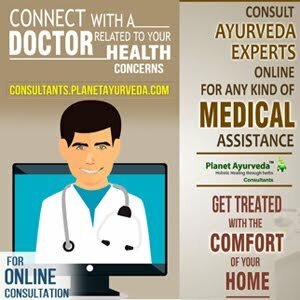 WHAT ARE THE ADVANTAGES OF TAKING THESE PRODUCTS FROM PLANET AYURVEDA? These products are 100% natural. It is a purely a vegetarian product. These products do not contain any chemicals, preservatives, starch, additives, colors, yeast, binders or fillers. 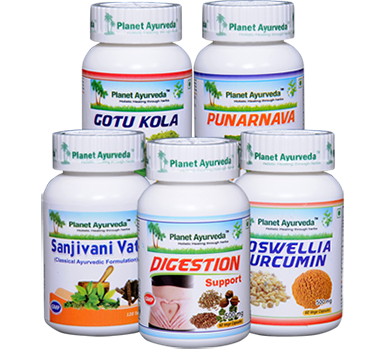 These products are available at Planet Ayurveda at a reasonable price with the best quality.